Every time there is an event, I am practically screaming, "I'll bring dessert!" Breastfeeding has turned me into a sugar monster, and I can't apologize because my mouth is too full of dessert. Cake! Cake! And more cake! That has been my life these days. I am in love and his name is cake. Anyway, if you are into cake as much as I am, then you are gonna truly love this one. The great thing about poke cakes is they are the easiest dessert to make, and they are just so yummy. And moist. And delightful. It's practically a religion. Aaaaaaamen. So ya make your cake according to manufacturer's directions. And then you poke it, you poke it. You know, like how people "poke" you on FaceBook. I hate that crap. When someone pokes me, I feel a little confused. I'm NOT poking you back. Unless you are a cake. Then there's something in it for me. Once it's good and poked, you can pour in your pudding. This whole beautiful concoction goes in the fridge. I usually give it a whole night, but you'd be fine with a few hours I think, especially if you are pressed for time. I cover mine with a little foil. The next day, I take it out and I CREAM THAT SUCKER! With whipped cream. Yuuuuum. I lick the tub. And I don't feel bad. So there! Add a little shaved chocolate, and we're good to go. And by go, I mean EAT. Time: Active, 10 minutes, Inactive, a while | Makes: 1 awesome cake | Difficulty: EASY! Make your cake according to the manufacturer's directions, using a 9 by 13 cake pan. The type of chocolate cake you use for this recipe is really up to you. My husband and I got a double chocolate fudge something or another. Literally every box said "pudding in the mix" which we were completely confused by. So we got the box that didn't say that...because we are putting pudding in the cake. Call us nuts. When the cake is finished remove it from the oven and allow it to cool for five minutes. After the five minutes, poke holes in the cake using the end of a wooden spoon. Do this uniformly. Mix your milk and pudding mix. 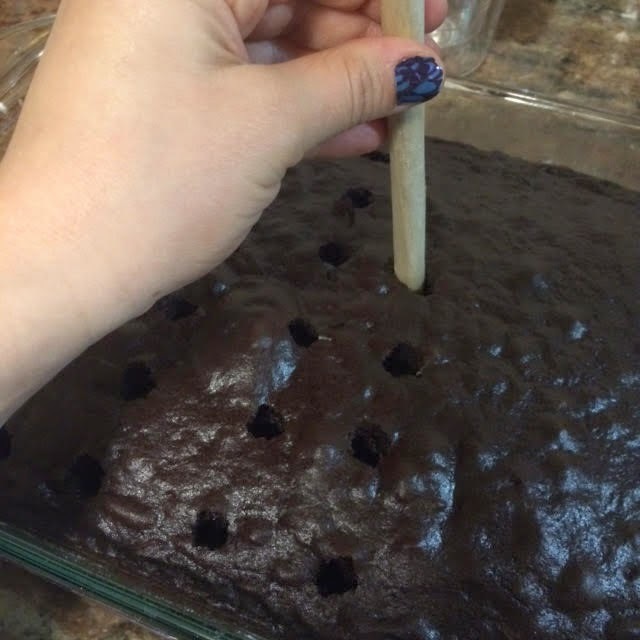 Pour onto the cake, taking care to pour it over the holes and spreading it evenly. Cover with foil and place in the refrigerator overnight. At this point, I would also note that you should take your whipped topping out the freezer and stick it in the fridge so it can be in perfect condition for icing the next day. Oh, AND, if you only have a few hours (say, you wanna make this in the morning for an evening party or dinner) you will be JUST FINE! Top the cake with the whipped topping and shaved chocolate (or mini chocolate chips) and serve. Goes well with coffee or tall glass of almond milk! YUM!! !